All About Equine Animal Rescue, Inc. (AAE) is a 501(c)(3) non-profit organization that relies on the selfless giving of its donors to continue its 'successful' rescue, rehabilitation, and rehoming programs. And as a non-profit, we believe in transparency providing donors and potential donors access to our financial and organizational documentation. 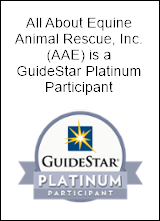 In alignment with being transparent, AAE maintains the highest level of participation with GuideStar (https://www.guidestar.org/profile/27-0384523), the Gold Participant rating. GuideStar is an organization that gathers and disseminates information about all IRS registered non-profit organizations, including its mission, legitimacy, impact, reputation, finances, programs, transparency, governance, and more.